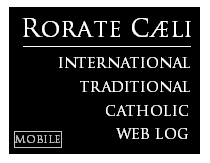 RORATE CÆLI: "The Pope Himself Says: Your Criticism is Good for Me" - And What will the Post-Synod Document Say? "The Pope Himself Says: Your Criticism is Good for Me" - And What will the Post-Synod Document Say? The letter Pope Francis sent to Antonio Socci on February 7th warrants the same attention as the book Socci dedicated to “The Last Prophecy. An Open Letter to Pope Francis in Times of War (Rizzoli, 2016). Socci’s book is divided into two parts: the first contains a set of prophecies, both recent and old, which point to grave catastrophes for the world should it refuse to convert and do penance. The material destructions predicted in many prophecies seem to be a result of the present spiritual devastation which the Church finds itself immersed in today. Among the many heavenly messages, there are those of the Virgin of La Salette and Don Bosco’s dream about the future of Rome which outline a scenario of tragedy and hope similar to the one Our Lady announced at Fatima in 1917. Other private revelations cited by Socci, could be considered questionable, but even so, the writer’s merit is nonetheless that of reminding us of the existence of the prophetic, apocalyptic dimension which is inseparable from historical Catholic theology. The second part of the book, in the form of an “Open Letter”, is a sound criticism of Pope Bergoglio whose actions and words the author has recorded meticulously from the beginning of his pontificate and which have left the faithful troubled, broken-hearted and at times scandalized to the point of asking themselves the question which dominated the cover of “Newsweek” on the eve of his visit to America: Is the Pope Catholic? Socci directs the following vibrant words to the Pope: “I beseech you: rethink the entire path you have taken until now, avoid other very grave steps, such as a post-synod Exhortation which would permit an opening to Cardinal Kasper’s ideas […]. Above all, avoid convoking another Synod, which - as is feared - is even going to target ecclesiastical celibacy. What all of us need the most is a great Jubilee of penitence.”(p.221). “Dear brother, I received your book and the letter that accompanied it. Thank you so much for this. May the Lord reward you. I have begun to read it and I’m sure that many of the things in it will be good for me. In reality, also criticism helps us to walk on the righteous path of the Lord. I thank you very much indeed for your prayers and those of your family and I promise to pray for all of you, asking the Lord to bless you and Our Lady to protect you. Your brother and Servant in the Lord, Francis. These few lines demolish a certain “papalotry” widespread in conservative circles. 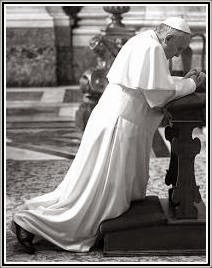 The Pontiff states that criticizing the Pope is not only licit but can “be very good” for the Pope himself, by helping him to “walk on the righteous path of the Lord”. With the term papolatry, we mean undue divinization of the Pope’s figure, which is very different from the veneration and devout respect we owe him for the office he holds. Frankness, also in criticizing, notes Socci, may be of help to the Bishop of Rome, “particularly when the prevailing mentality exaggerates with adulation” (p.92). The great Dominican theologian Melchoir Cano states: “Peter has no need of our lies or adulation. Those who blindly, indiscriminately defend every decision by the Supreme Pontiff are those who undermine most the authority of the Holy See: instead of reinforcing its foundations, they destroy them”. Someone might say that Francis’ letter to Socci is directed to “include” everyone, from the progressives to the traditionalists, in a syncretistic embrace. Yet, beyond the intentions, what counts are the facts and the fact in this case is the appreciation the Pope expresses for his critics. Francis’ words to Socci are extended to all those who have criticized the new pontificate over the past three years: from Alessandro Gnocchi and Mario Palmaro to the articles written by Ross Douhat in the “New York Times” to the petition published by a group of Catholic writers on “The Remnant”, of December 8th 2015. Francis reminds us that we can criticize the Pope’s non-infallible acts, especially regarding his political and pastoral choices, on the condition that the criticism is respectful and regards the errors of the person and not the authority of the papacy. The betrayal of the Catholic political class has always gone hand in hand with the betrayal historically of high-ranked ecclesiastics, but it has never happened that a Pope would choose[someone like] Eugenio Scalfari as his confidante and indicate people like Emma Bonino and Giorgio Napolitano as great figures of present-day Italy, without even spending a word of encouragement and incentive, or even a simple benediction to the hundreds of thousands of Catholics gathered at Family Day. And while they were passing in the Senate the Cirinnà law, which legalizes homosexual unions, Pope Francis, after keeping silent about it in Ireland, also kept silent about it in Italy, taking upon himself grave responsibilities. “Why Holy Father – asks Socci in a sorrowful tone – have you stopped opposing that deadly attack on the family which the world has been engaged in for years? (p.127). On March 8th, in “Libero”, Socci intervened opportunely by criticizing the birth of a new Catholic political party, following the experience of Family Day. The idea of transforming religiously inspired associations into something political has always failed in the past - explains Socci. Yet, the error is not only in the timing and manner this initiative was announced. It is the idea itself of a Catholic political party, constrained to accept the rules of a relativist democracy, which needs to be rejected, as movements of opinion are able to influence politics in a much more efficacious manner than political parties. Will the post-Synod Exhortation Pope Francis signs on March 19th be a new passage of this process of auto-demolition? Will he confirm the Church’s doctrine or will he deviate on some points from the perennial Magisterium? And if this is the case, how should Catholics act? These are the urgent questions on the table. Questions that demand all the attention an intelligence illuminated by grace is capable of.